Special Attack1: Plasma Cannon: attacks with an ultra-high energy plasma shell shot from his mouth. Special Attack2: Nighthawk: burst of energy from his midsection that disintegrates the opponent. Special Attack3: Trident Tail: produces a shockwave by swinging his tail. 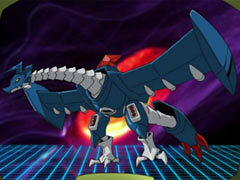 MailBirdramon is a member of Blue Flare and is the main companion digimon of Aonuma Kiriha. He appeared in the first Digimon Xros Wars episode.